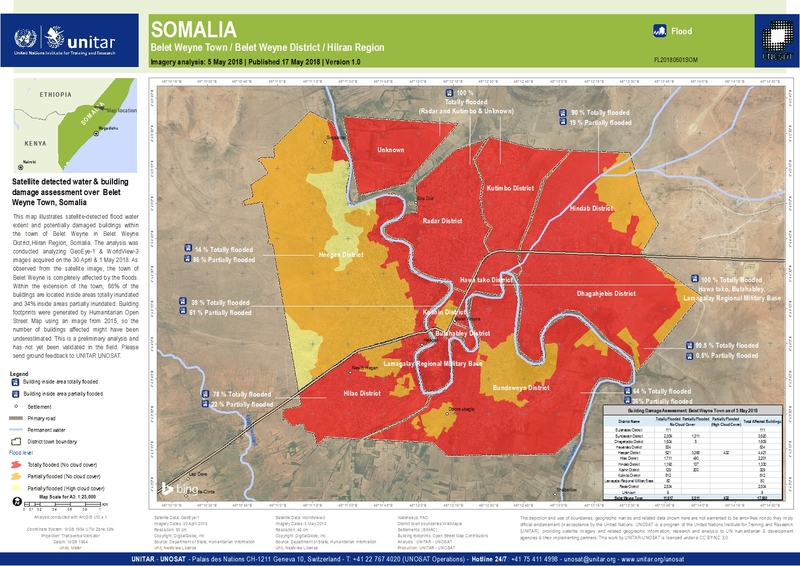 This map illustrates satellite-detected flood water extent and potentially damaged buildings within the town of Belet Weyne in Belet Weyne District,Hiiran Region, Somalia. The analysis was conducted analyzing GeoEye-1 & WorldView-3 images acquired on the 30 April & 1 May 2018. As observed from the satellite image, the town of Belet Weyne is completely affected by the floods. Within the extension of the town, 66% of the buildings are located inside areas totally inundated and 34% inside areas partially inundated. Building footprints were generated by Humanitarian Open Street Map using an image from 2015, so the number of buildings affected might have been underestimated. This is a preliminary analysis and has not yet been validated in the field. Please send ground feedback to UNITAR UNOSAT.